Written by Peter A. Carfagna, Distinguished Practitioner in Residence at the School of Law at Case Western Reserve University, about the new course Representing the Professional Athlete starting Sep 16th 2014. 10. Stay on top of the field (pun intended): Obtain and maintain an in-depth knowledge of the current trends in the sports in which you want to represent a Professional Athlete – including a “deep dive” into the relevant rules and regulations of the sports in which you seek to represent Professional Athletes. 9. Know your clients better than they know themselves: Obtain and maintain an in-depth knowledge of the career paths of the Professional Athletes that you want to represent – “Know Your Client,” as well or better then he or she can know himself or herself. 8. Obtain necessary certifications: As you focus on your specialty sports, you should research and then satisfy the Certification-qualification requirements for each League, Team or Federation in which you want to represent a Professional Athlete. 7. Know your competition: As you do so, continuously survey the relevant Agent competition for representing the Professional Athletes whom you seek to represent – conduct “due diligence” upon, and seek to emulate those Agents whom you most admire and seek to compete against. 6. Data, data, data: In so doing, develop an expertise or “competitive edge” that will allow you to best represent your Athletes, given your chosen areas of expertise – a deep dive into the relevant “data analytics” of your sports will likely be required. 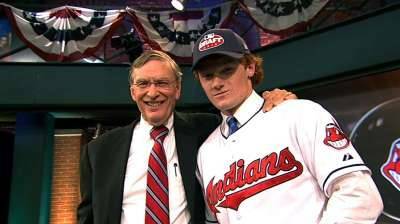 L to R: Bud Selig (MLB Commissioner), Clint Frazier (Outfielder, Single A Affiliate of the Cleveland Indians). Join Clint in week 3 to discuss career set up on and off the field to maximize athletic and financial success. 5. You are your own brand: As you develop your Agency practice, take advantage of any personal or professional network connections to “get your foot in the door” with Professional Athletes — use social networking and legitimate “self-promotion” as you advertise your Agency’s advantages at the relevant events in the relevant markets and industry publications. 4. The power of endorsements: have your athletes ‘endorse’ you: As you grow your Agency, ask your current Athletes to serve as “spokespersons” for you, to help you represent others in their peer group of Athletes – be ever-present at the most important games, tournaments, etc., where your Athletes compete, and continue to network during those events. 3. Honor relationships: In so doing, however, never forget to pay close attention to those Athletes who helped start your Agency practice–and treat each and every Athlete Client as if he/she “were your only Client” – while maintaining total transparency and professional integrity throughout the representation process. 2. Attention to detail: Throughout this process, maintain tireless attention to detail as your Agency practice grows— surround yourself with the best and brightest associates and experts in areas where you need additional advice and support. Always remember — your competitors are likely “stalking” your key clients, so you are only one “misstep” away from losing them. 1. Take the Representing the Professional Athlete MOOC: From the course you’ll be able to learn from the Top Experts in the world of sports about the “best practices” for representing your target group of Professional Athletes!